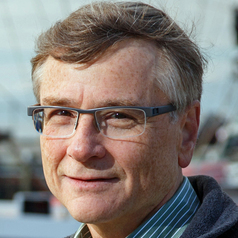 His collaborations include global studies of marine biodiversity, economics of fishing, and impacts on birds and mammals; and desire to develop better ways to assess the health of exploited marine systems, the impacts of climate change, and the social consequences of mismanagement. More recently he has mapped global fisheries catch since the 1800’s, traced global seafood trade and explored the limitations to ocean production. These collaborations have recently been recognised by a Highly Cited Researcher decadal awards by Clarivate Analytics (Thomson Reuters) for 2017 and 2018 for ecology/environment and fisheries.